Hyponatremia is also commonly known as water intoxication. During hyponatremia, the water and sodium that are lost to perspiration are replaced in return only with water, which leaves the body low in sodium. While hyponatremia has always been a major concern during military training, increased occurrences of hyponatremia are often the direct result of athletes drinking lots of water during endurance sports. Hyponatremia can also occur as a result of binge alcohol drinking. 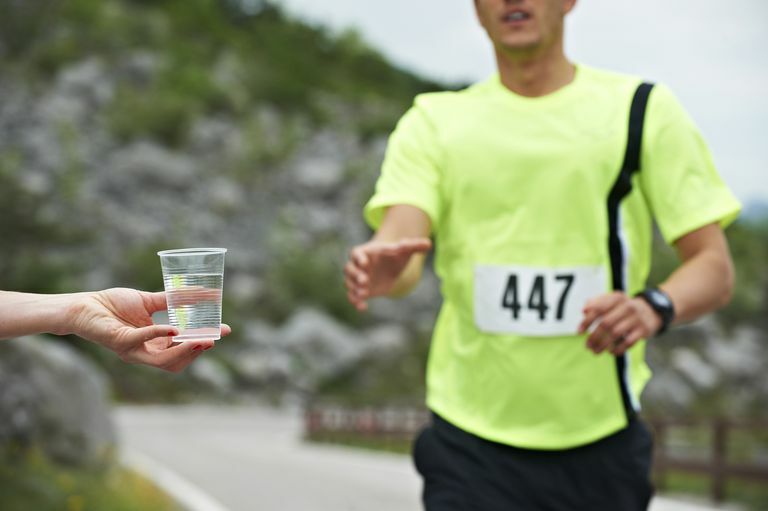 Participants in marathons and other endurance events across the nation have become confused and even collapsed during competition due to hyponatremia. However, many more participants in these very events have also become confused and collapsed from dehydration, heat exhaustion, or heat stroke. It is often difficult to initially tell the difference between heat exhaustion and hyponatremia based on the symptoms. The need to remain hydrated during periods of exertion, particularly in hot climates, is well-known, but it also makes it difficult to recognize hyponatremia symptoms. Severe dehydration and heat exhaustion look very similar to hyponatremia and, like hyponatremia, are more common in hot weather during exercise. There is very little that can be done outside of an immediate trip to the hospital for hyponatremia, so differentiating between dehydration and hyponatremia is the most important part of hyponatremia first aid. The symptoms are similar enough that a good assessment must include interviewing the patient and witnesses to determine is the patient was drinking water or not. patients with slurred speech, confusion, severe weakness, or loss of consciousness need medical attention immediately. Call 911 for these patients as quickly as possible, regardless of the cause. Heat exhaustion and dehydration can look very much like hyponatremia and are much more common. Heat stroke has a distinct set of symptoms and is a serious emergency. Determine if the patient has been staying hydrated. If witnesses can confirm the patient has been drinking at least a pint of fluid per hour during exercise, consider the possibility of hyponatremia. In cases of rapid massive water intake -- such as college fraternity initiation -- consider the possibility of hyponatremia. patients of hyponatremia need salt in order to even out the body’s sodium levels. In minor cases -- usually, just when nausea is present -- before cramps, dizziness or confusion occur, patients may feel better immediately after salty food intake. Be very careful not to treat dehydration as hyponatremia and suggest salty foods when the patient really needs fluid. Assume any patient complaining of thirst is dehydrated. Avoid NSAIDs like ibuprofen, aspirin, or naprosyn when concerned about hyponatremia. These pain relievers may make symptoms worse. Almond, Christopher S.D., et al. "Hyponatremia among Runners in the Boston Marathon." New England Journal of Medicine. 14 APR 2005. Vrijens, D. M. J., and N. J. Rehrer. "Sodium-free fluid ingestion decreases plasma sodium during exercise in the heat." J Appl Physiol. Vol. 86, Issue 6, 1847-1851, June 1999.